First I want to praise the enchanting villas. Stay away from those oversized hotels where too many employees trip over you with a false smile. Stay at the small villas where your quarters are comfortable and plush, where service is so personal you feel like home, and where the environment is as filled with orchids, lotus blossoms, frangipani flowers, sculptures, giant palm fans, banana leaves and ways to get in and out of the scorching heat of the day. In Chiang Mai, Rangsit Villa was a hideaway in a jungle of flowers, streams and fantastic food. Only two master suites and three bedrooms so it has a home-like appeal and more attention than you can imagine. They arrange everything you want to do and then things not on the tourist calendar. 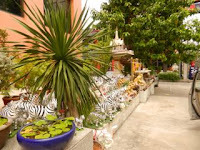 My favorite, as this is my second visit, is Chakrabongse Villas, managed by a charming young lady named Atom, there are three doubles and a family villa for three. It is right on the active river and you can watch the boats pass up and down as you eat a breakfast of every kind of exotic fruit or a night dinner the chef prepares just to your liking. Every time I moved, there was a glass of cold lemon grass tea filled with crushed ice. The days were hot and sweat became invisible after awhile, but that iced tea revised me in a minute. 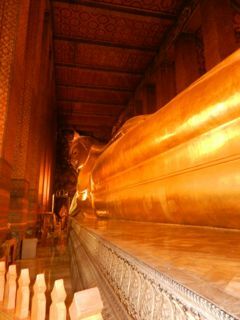 Chakrabongse is within a block not only of great Thai street markets, but also my favorite place to visit - the Wat Po, which houses Thailand’s largest reclining buddha, dramatic, guilded, and awesome. If you’ve never stood before big, this Buddha is BIG. It’s length is about 100 feet long. It’s feet are flat and about ten feet long. On the bottom of the feet is a mother-of-pearl detail of the 108 auspicious signs of a genuine Buddha. This Wat is also special, the oldest one built in the 16th century, because it is home of the Thai massage school where the rage began. Here I dropped the 108 coins in the 108 pots for good measure and a safe trip home. Scheduled for my last day was a tour of spirit houses. Photographer Jock Montgomery hired a green and yellow cab to lead the scavenger hunt. 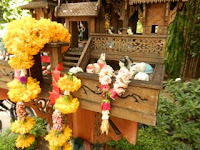 Spirit houses are peculiar to Thailand. In auspicious locations on most properties, the occupiers erect spirit houses that look like temples, old teak houses, and one creative one was an architectural artwork made of glass. When you want to place one, a Brahma priest must come to your site on an auspicious calendar day to tell you where to place it. (Sort of a Fung Shui). 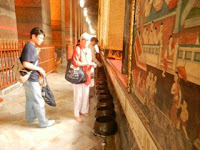 Most sacred are those placed next to the Bodi or Banyan tree (a ficus). These houses are filled with ceramic figures (Nats) of Thai dancers, of horses, of elephants, of children and usually an old man and an old women. Before the structures are plates of sweets, cigars, beetle nuts, fruits sliced artistically, glasses of water, marigold chains, jasmine leis, some more elegant than others. 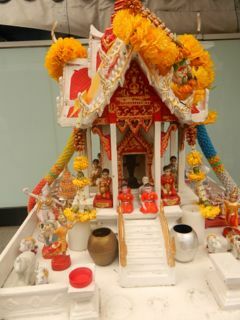 Even the poorest person will have a spirit house. 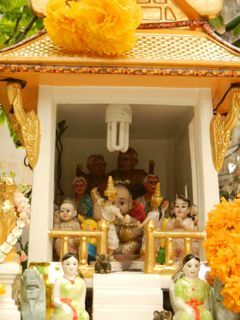 They are a must because these offerings keep the spirits - evil and good - entertained so they won’t get into the house proper and cause disturbances or damage. Spirits are mischievous like elves and fairies. Great idea. 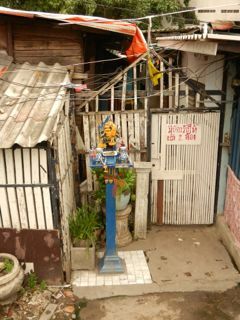 I wondered if I could do a church spirit house in front of my house but realized it and anything I put around it would be stolen in an hour. 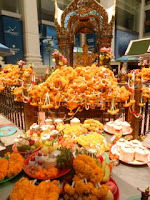 But the burden is every single day you must lay out food, flowers, and whatever it takes to keep the spirit house thriving. Fear not, the loss of your offerings. The Thai people respect the religiosity of the tradition. You don’t mess with spirit house stuff. As we photographed these houses, we also stopped at some rather weird shrines. One in particular Chao Mae Tuptin, built by Nai Lert to honor a spirit in the large ficus tree in its midst. It became a location for those short on fertility. And now, not only are wedding dresses hanging from trees, but the place is filled with phallic forms - not subtle things, but exactly what I said. Don’t bring the kiddies here. There are red, gold, brown, bronze, pink, whatever ones of wood and metal. They are pressed into two Boda tree trunks and are just everywhere. Seriously. Another shrine which is so filled with petitioners, marigold and jasmine stringers, lottery ticket buying, Thai girls dancing, incense burning, and activity (it’s the only thing I saw that resembled the bustle of Buddhist temples and monasteries in Tibet) was Erawan Shrine to the Hindu god Brahma and his elephant Erawan. Here miracles happen to those who are having severe problems. 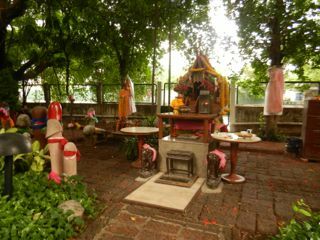 Make an offering of three incense sticks, a candle, a jasmine/marigold garland and a piece of gold leaf to all four faces of Brahma. Then if good things happen, problems are solved, you must come back with another offering of thanksgiving or else bad things happen. 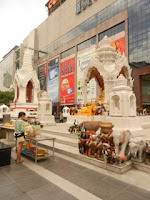 The Trimurti Shrine is at one end of the world’s largest department store, called Centralworld. 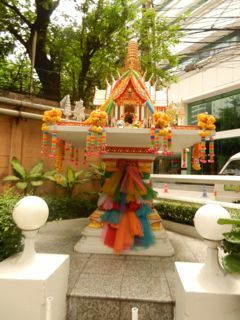 I dare not go inside but outside it is, like so many things in Thailand, out of proportion giant. Got to be there on a Thursday at 9:30 a.m. when young people come in droves to resolve romance and/or marriage problems. If you need a boyfriend, this is the place to start. 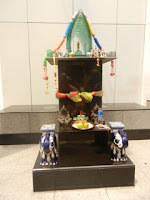 Apparently it is said that Lord Trimurti descends from the heavens to answer the needs of your heart. To help it along, offer 9 red incense sticks, red candles, red roses, and fruit. I wonder why the gods were surrounded with statues of bulls, zebras and elephants. Lots of them. And, although I was there on Wednesday, there were plenty of young people in prayer and offering mode.